Owning a pool is constantly a balancing act. You must balance the time you spend caring for your pool with the time you spend enjoying it. Spend too much time on maintenance, and there's no free time left to have fun in your pool! That is just one of the many advantages of fiberglass pools: the lowest-maintenance in-ground pool available on the market today. Vinyl liners and concrete pools both have porous surfaces, and it's easy for mold, mildew, bacteria, etc., to embed itself in those tiny cracks and crevices. That can cause water quality issues, as well as damage the looks of your pool. Fiberglass is smooth, offering no such hiding places for the yucky things you're trying to keep out! Let's look at what goes into maintaining a fiberglass pool, and then we'll discuss ways to keep down regular pool maintenance, giving you more time to jump in and enjoy that beautiful, clear water! No good cook goes willy-nilly with the salt shaker before tasting a dish. Similarly, you don't go pouring chemicals in your pool like a rogue alchemist without testing the water. You will test for chlorine levels, pH balance, calcium hardiness, cyanuric acid (CYA), and total alkalinity. Yes, this is the same for all pool types. The good news is, fiberglass pools require a lot less adjustment with chemicals to keep these levels within healthy boundaries. This means less frequent testing and less frequent adding chemicals. Armed with a good water test, you know exactly what to do. It's important to always pay attention when you're buying, so you get chemicals formulated for your fiberglass pool. There is less brushing and tinkering with fiberglass, but that doesn't mean none. You'll need to skim out leaves occasionally, too. 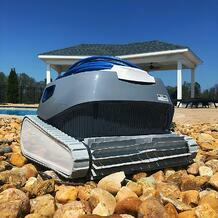 Using a skimmer and automatic pool cleaner significantly reduces the amount of time you spend brushing and scooping in your pool. Fiberglass pools require only one circulation of water through the filter each day. That means that the entire body of water should pass through the filter once every 24 hours—the actual turnover time is usually about 8 hours. This is less than concrete pools, saving you both time and money on those energy bills. For more info on the pump/filter run time for your pool, check out our article How Long Should I Run My Pool Pump? Water evaporates, and your pool water, unfortunately, is no different. It's important to keep the water level midway to two-thirds of the way up the skimmer, or it can't work properly. 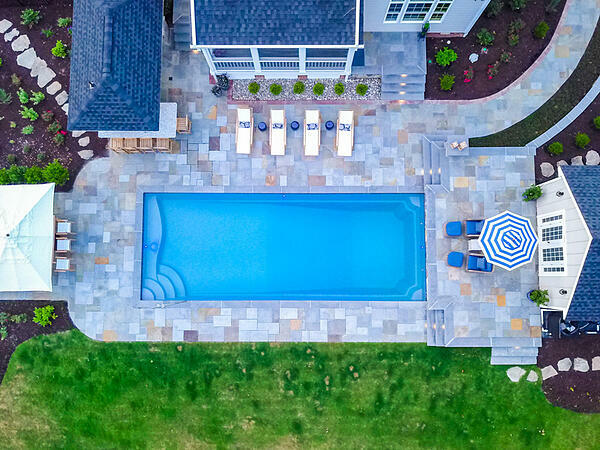 The time of year, the amount of rainfall you get, the temperature and humidity, how much water the kiddos splash out playing cannonball... there are numerous factors that affect how often you'll need to add water to your pool. Maintenance comes with pool ownership, just like owning a home, car, boat, or anything else. But just like gutter guards and a good mechanic can lessen home and auto maintenance, a savvy pool owner can do several things to keep down the time and effort it takes to maintain a fiberglass pool. Perhaps no other investment pays off like owning a pool cover. Sit in your backyard for an afternoon, picturing where your new pool is going in, and you'll observe things you never noticed. Your neighbor Bill's maple tree sure does drop a lot of leaves. Wow, there sure are a lot of birds flying overhead. Look at the bugs! Did you ever notice how much dust and debris clouded over the fence when Sam mowed his yard? Covers keep all this out of your pool. That's less stress on your pump and filter, less wear and tear on your automatic cleaner, and less work for you! Not to mention the savings in energy and chemicals. Plus, pool covers are your safety net if someone sneaks in when you aren't looking. A wandering toddler visiting your next-door neighbors. Those wild and crazy teenagers down the street. Your cousin's child with cognitive challenges. A pet who gets lost and strays by. There is literally no telling how many lives—both human and animal—are saved each year by a good pool cover! We've mentioned this a couple of times here, but it's worth mentioning again. If you have to manually clean your pool all the time, it's going to seriously hamper your enjoyment of your pool, as well as the time you have to enjoy it. You'll thank yourself every day you own your fiberglass pool. "But we save so much money!" they say. "Why is our pool green?" they ask. The cheap, discount, and/or generic pool chemicals sold online and in big box stores contain the exact same chemicals as the brand names carried by reputable pool dealers. So what's up with those prices? The cheap stuff is watered down. Therefore, it takes more of it to do the same thing. So you really aren't saving if you have to use twice as much to get half the results. The "expensive" stuff generally is highly concentrated and is usually backed by some sort of guarantee. You use less. It works better. Win-Win! So, you've read this article, and it still seems like too much effort. That's okay. You can hire a service to test your water and do regular maintenance on your fiberglass pool. 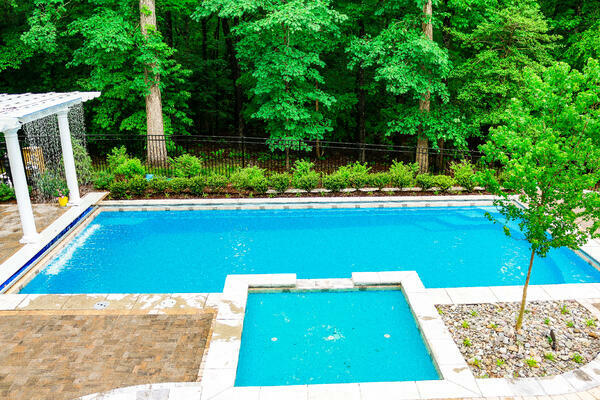 Most services offer a variety of packages, such as opening and closing your pool for the seasons, water testing, adding chemicals and cleaning the pool, changing filters, etc. Most also offer different frequencies, such as weekly, biweekly, monthly, etc. Be sure you understand how frequently they will come and what is and isn't included in the service. For instance, they may charge extra for whatever chemicals or other products they have to use. Filters will also be extra. Also, be aware that maintenance plans do not usually include service calls. If something is broken or there is a problem, that will probably be an extra service charge that is not covered under your maintenance plan. How much time does it really take to maintain a fiberglass pool? If you're rigorous about it, a few minutes per week is all it takes! Fiberglass is far easier and cheaper to maintain than either concrete or vinyl liner pools. Are you ready to learn about buying your own fiberglass pool? We've designed an e-book to help you navigate the entire process! Just click below for the free download.